I am looking for a good wifi connection in Ubud (Bali, Indonesia). I need to upload a fair amount of videos and pictures (6+ GB), and give a couple of Skype/Hangout phone calls. I used Wifi.id (in Java mostly) in the past but here I went to 2 advertised locations on their website, one I could not find at all, the next one (in a restaurant) was down for some reason. If anybody knows a place with a decent wifi, that'd be great. Thanks. kismetbali.com: a cafe/restaurant/shop providing fast internet, see on the website `Finding fast internet in Ubud has been quite a challenge. We pay top dollar to provide our customers with fastest Fiber Optic available in the region. Uploads or Downloads its Ultra-Fast. If planning to be on the move, getting an LTE sim card or a 3G sim card is probably a good solution too. See the other answer provided for further details on LTE sim cards. Telkomsel has the best coverage in Indonesia in my experience, but it's a bit more expensive, 255'000 IDR for 8GB of data valid 30 days on a 3G network (in 2015). Indosat has a poorer coverage in Indonesia in my experience, but it's cheaper (& usually works fine in cities), if I remember well the price is around 180'000 IDR for 8GB of data valid for 30 days on a 3G network (in 2015). 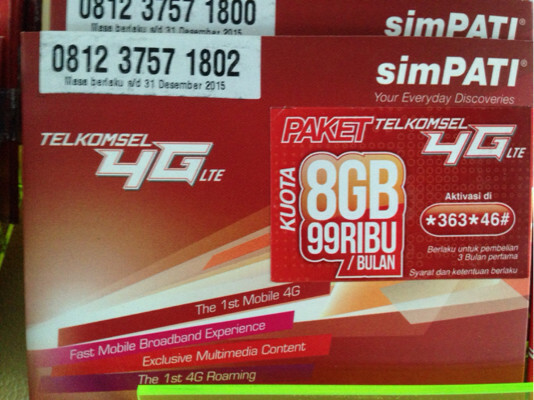 Telkomsel has offers for LTE (4G) sim cards, but I think it's only coming with contracts (not prepaid), see picture below. It looks like most terrestrial ISPs in Bali are using legacy copper (ie. repurposed telephone and coaxial TV cables). The highest upload speed you'll achieve at any single site served by legacy copper is most likely limited to 5Mbps. The 5 Mbps upload speed limitation is inherent to most legacy copper networks because their bandwidth is rather limited and ISPs allocate much more spectrum to download than upload. I have found a few exceptions where coax cable provided up to 15Mbps upload, but that seems to be very rare. In my travels I have found that the vast majority of wifi hotspots are served by legacy copper (you can infer as much rather easily with the right network tools). While I have never traveled to Bali, I don't see why the situation would be any different there. How Long Will the "6Gb" Upload Take? I assume you you need to upload 6 gigabytes of data (as opposed to gigabits). If you were able to find a hotspot where you could use the full 5Mbps upload bandwidth, the 6 GB of data you need to upload would take about 3 hours). That's best case scenario. I would expect it to take 4x to 10x that long because you'll probably experience network congestion or QoS that reduces your upload speeds. So you're looking at maybe a half GB upload per hour if you are sort of lucky. MetroNET seems to be an ISP in Bali that uses fibre. Fibre, in general, does not wind up with an inherent upload speed limit the way legacy copper does. I would try to find a hotspot served by this network for there is at least a hope of achieving the upload speeds to get your images and video out. Even if the site has a fibre connection, your connection might still be throttled so you'll still have to do some testing to be sure. I generally run Ookla's speed test on any network I might need to use while traveling. I find bandwidth to always be a struggle when traveling, so I like to know early what speed networks are available. Your best bet may be a local LTE SIM card. I regularly achieve 20 Mbps upload speeds over LTE when traveling. That would bring your 6 GB upload down below an hour. You'll have to be near a good cell tower and consider bandwidth caps, but it might be your only practical solution. This solution is kind of a moving target because it depends on finding a network operator that offers reasonably-priced prepaid short-term data plans. So far I have found that the availability of such plans for any given network operator changes from time to time (at least in North America and Europe). I tried to determine if one of the Indonesian operators offer such a plan without success (I can't read Indonesian). There's really great wifi at Outpost coworking in Ubud another one of my favorite spots is Bali Bohemia. Really chilled out environment although sometimes there wifi cuts out and they have aggressive monkeys all around that will potentially try to steal your food. For coworking, Outpost, best place for productivity in my opinion. Coffee shops, Bali Bohemia is nice. Nowadays there are also providers that use coax and fibre optics. In Ubud you can get a cable internet (coax) connection through Biznet. They have packages up to 100mbps. Not the answer you're looking for? Browse other questions tagged internet indonesia wifi bali or ask your own question.